monsters | Kill All Monsters! I have a couple of buddies who are my go-to guys for all things giant monsters. They’re far better read in the genre than I am and I’ve learned to trust their tastes. But I’m not one to follow advice blindly either, so when one of them told me to skip Monsters, I prepared myself for disappointment with the movie, but didn’t take it out of my Netflix queue. My pal was kind enough not to reveal spoilers, but one of my favorite giant-monster blogs, Giant Monsters Attack! recently ran a review that let me know what my buddy was talking about. 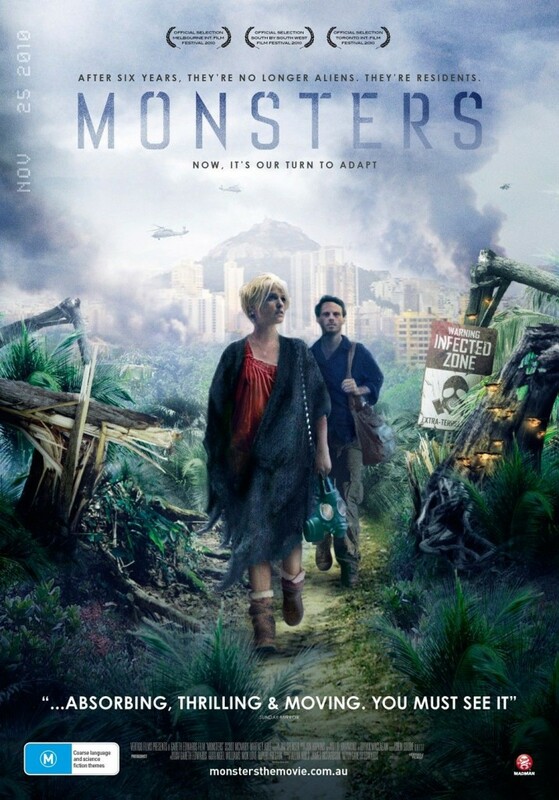 I haven’t taken Monsters out of my queue yet, but I’ve now lost all enthusiasm for the movie. Let’s just cut to the chase here; if you’re hoping for a cinematic monster mash, prepare to be disappointed. It’s not thatMonsters is an entirely bad movie, but the squid thingys are basically peripheral decoration in a film that’s focused on something else entirely. This is really a road trip story about two somewhat selfish characters who come to understand each other and themselves in a parable concerning globalization and the strained relationship between Mexico and the United States. This entry was posted in Giant Monsters, Giant Movies and tagged monsters on January 19, 2011 by Michael May.